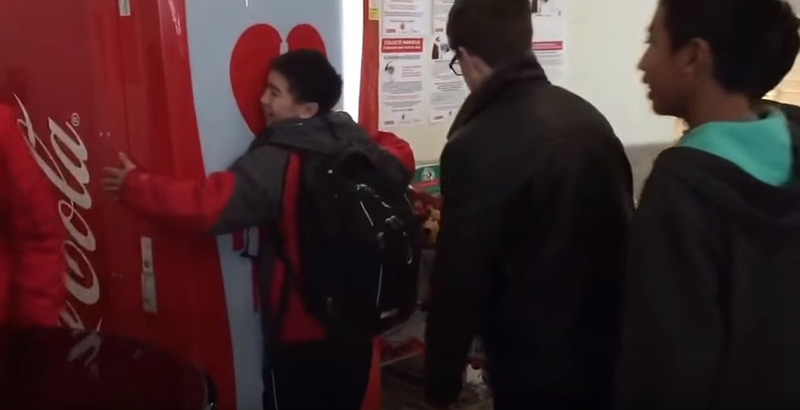 Children lined up yesterday to hug an Ottawa City Hall based Coca-Cola vending machine to get a free cola. Why is the City of Ottawa currently handing out free Coca-Cola at City Hall? What could possibly be in it for the city? I'm genuinely not sure what the answer is. I asked the Mayor yesterday, but unfortunately didn't hear back. I have to imagine it might be along the lines of holiday spirit, or "fun". I know what's in it for Coca-Cola though. Virtually free, powerful, emotional, branding, along with the opportunity to inculcate themselves with Ottawa City Hall where at least one City Councillor tweeted out a video (which I've uploaded to YouTube) of the next door school's kids having at it. His positive tweet suggests the probability that the hug based vending machine bought some Coca-Cola goodwill with him - something that might be useful were the city to one day consider a soda tax or moves to limit the vending of sugar sweetened beverages in city run buildings. Literally one million Lisgar kids are getting free full-sugar pop from a huggable Coke machine at City Hall. The question that we have to consider as a society is whether there are ways other than handing out sugar water or junk food to inspire holiday spirit or "fun", and perhaps more reflectively, how it is we've come to a point in time where using junk food and sugar water to entertain at every event no matter how small, is so normalized that it occurs even in the City Hall of the city whose Mayor is Ontario's former Minister of Health Promotion? UPDATE: According to reporter David Reevely, the city has a $250,000 per year "Pouring Rights" contract with Coca-Cola. The city says the Cokes-for-hugs machine is part of a 5-year "pouring rights" deal with Coke. They move it around. A day here, a day there.